Tata Motors found five of its models in this list while Maruti Suzuki and Honda had only one each. In the earlier post, we covered best selling 30 cars of India. In this post, we will talk about the least selling cars in 2018. The list saw Maruti Suzuki India Limited safely out of the list except for the lone Gypsy. It was Tata Motors that had five of its cars on this list, starting with the Hexa and Sumo and also including the Safari, Bolt and Nano. Tata Motors Hexa, which was at the bottom of this list on No 30, saw sales in 2018 at 9,764 units as compared to 13,502 units sold in 2017, a 28 percent dip in sales. Tata Sumo sales increased marginally from 2017 to 2018. Sales in 2016 were at 9,048 units which went down to 6,521 units in 2017 but gained some traction in 2018 with sales at 7,286 units. Fiat Linea being delivered to customer. Tata Safari was at No.24 on the list of least selling cars in 2018. However, sales of this model also improved significantly from 2017 to 2018. Sales in 2016 stood at 7,003 units which dipped to 4,308 units in 2016 but recovered to 6,138 units in 2018. Another car from Tata Motors to stand at No. 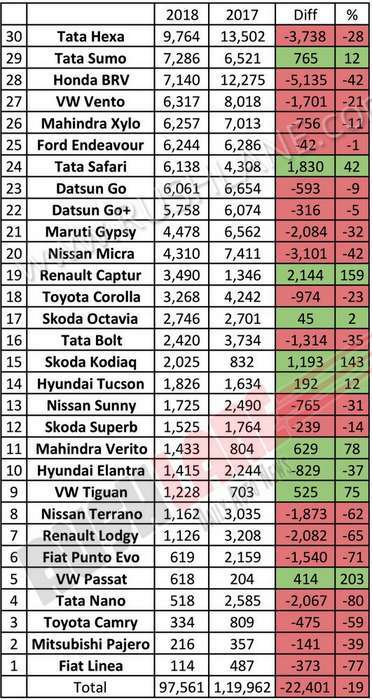 16 on the list of least selling cars was the Tata Bolt. In this case, sales of the Bolt hatchback went from 7,875 units in 2016 to 3,734 units in 2017 and down even further to 2,420 units in the last year. The Nano hatchback is on its way out and the company has even stopped taking in bookings. Honda Cars had the BR-V on this list of poor performers in 2018. Sales of the Honda BR-V which stood at 16,820 units in 2016 dipped to 12,275 units in 2017 and down further to 7,140 units in 2018. Least selling cars of India for 2018. Source – Auto Punditz. Volkswagen Vento, Tiguan and Passat also featured among the least selling cars in 2018. The Vento, at No. 27 on the list of 30 least selling car, is now 9 years old. It saw sales dip from 11,401 in 2016 to 8,018 units in 2017 and down to 6,317 units in 2018. Sales of the VW Tiguan recovered over 2017 and 2018. Sales in 2017 stood at 703 units which went up to 1,228 units in 2018. Mahindra had the Xylo MUV and Verito sedan among its least selling cars. The Xylo sales stood at 6,361 units in 2017 and at 7,013 units in 2017 which went down to 6,257 units in 2018. Mahindra Verito sedan has shown poor performance ever since launch. Sales in 2016 stood at 3,520 units which dipped to 804 units in 2017 but recovered to 1,433 units in 2018. Ford India saw sales of the Endeavour SUV slow down over the past three years primarily due to competition from the Toyota Fortuner and newly launched Mahindra Alturas. Sales in 2017 which stood at 6,564 units dipped to 6,286 units in 2017 and down further to 6,244 units in 2018. This dip in sales has found the Ford Endeavour at No.25 on the list of 30 least selling cars. Datsun GO and GO+ both showed poor performance and featured at Nos. 23 and 22 on this list. Sales of the GO which stood at 9,964 units in 2016 went down to 6,654 units in 2017 and to 6,061 units in 2018 while similar results were seen where the GO+ MUV was concerned with sales at 5,758 units in 2018. Nissan Micra, Sunny and Terrano all showed poor performance since launch. Micra hatchback saw sales at 8,076 units in 2016 which dipped to 7,411 units in 2017 and down to 4,310 units in 2018. Nissan Sunny sales in 2017 stood at 2,390 units which went down to 1,725 units in 2018 while sales of the Terrano went down from 4,717 units in 2016 to 3,035 units in 2017 and to just 1,162 units in 2018 primarily due to increased competition in this segment. Renault had the Captur SUV and Lodgy MUV on this list at Nos. 19 and 7 respectively. Lodgy sales dipped from 4,984 units in 2016 to 3,208 units in 2017 and down to 1,126 units in 2018. Toyota Corolla and Camry were at Nos. 18 and 3 respectively. They also noted a significant dip in sales which was more evident where the Camry was concerned due to a higher GST percentage on hybrid cars pulling down sales. Camry sales which stood at 1,347 units in 2016 went down to 809 units in 2017 and to just 334 units in 2018. Skoda Octavia, Kodia, Superb, at Nos. 17, 15 and 12 also brought in lower sales Octavia sales in 2018 were at 2,746 units while Kodiaq sales increased from 832 units in 2017 to 2,025 units in 2018. Superb sales went down from 1,764 units in 2017 to 1,525 units in 2018. Hyundai Tucson noted low sales due to its overpricing with sales going down from 4,345 units in 2016 to 1,634 units in 2017 to 1,826 units in 2018. Elantra sales also dipped in 2018 to 1,415 units. Fiat had the Punto Evo in this list at No, 6. 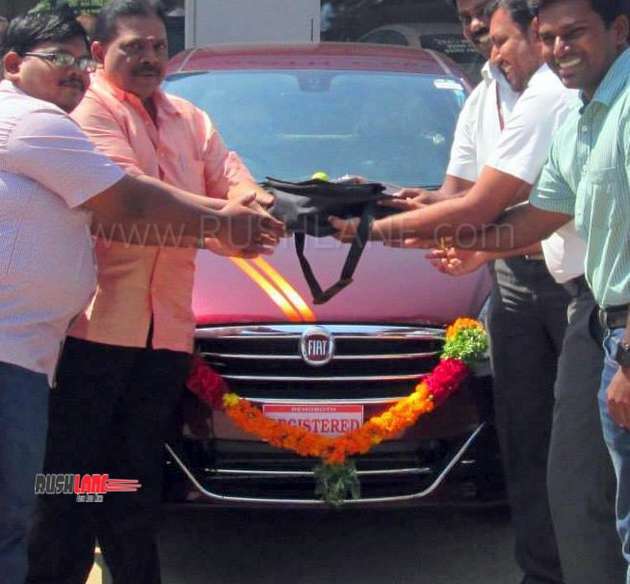 This car too is very old, to attract any buyers to its fold – with sales falling from 5,241 units in 2016 to 2,159 units in 2017 and to just 619 units in 2018. Fiat Linea, is the least selling car of India in 2018. Its sales also fell to just 114 units in 2018. Fiat brand will soon exit India, as production of Linea and Punto will officially come to an end.